Monte Cassino (sometimes written Montecassino) is a rocky hill about 130 kilometres (81 mi) southeast of Rome, Italy, 2 kilometres (1.2 mi) to the west of the town of Cassino and 520 m (1,706.04 ft) altitude. Site of the Roman town of Casinum, it is best known for its historic abbey. St. Benedict of Nursia established his first monastery, the source of the Benedictine Order, here around 529. The hilltop sanctuary was the site of the Battle of Monte Cassino in 1944, where the building was destroyed by Allied bombing and rebuilt after the war. The site has been visited many times by Popes and other senior clergy, including Pope Benedict XVI in May 2009. Since the reforms of the Second Vatican Council the monastery is one of the few remaining territorial abbeys within the Catholic Church. On 23 October 2014, Pope Francis applied the norms of the motu proprio Ecclesia Catholica (Paul VI, 1976) to the Abbey. This act removed from its jurisdiction all 53 parishes and reduced its territory to the Abbey itself - while retaining its status as a Territorial Abbey. The former territory of the Abbey, except the land on which the Abbey Church and monastery sit, was transferred to the local diocese of Sora-Cassino-Aquino-Pontecorvo. 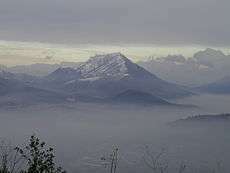 The history of Monte Cassino is linked to the nearby town of Cassino which was first settled in the fifth century B.C. by the Volsci people who held much of central and southern Italy. It was the Volsci who first built a citadel on the summit of Monte Cassino. The Volsci in the area were defeated by the Romans in 312 B.C. The Romans renamed the settlement Casinum and build a temple to Apollo at the citadel. Modern excavations have found no remains of the temple, but ruins of an amphitheatre, a theatre, and a mausoleum indicate the lasting presence the Romans had there. According to Gregory the Great's biography of Benedict, Life of Saint Benedict of Nursia, the monastery was constructed on an older pagan site, a temple of Apollo that crowned the hill. The biography records that the area was still largely pagan at the time and Benedict's first act was to smash the sculpture of Apollo and destroy the altar. He then reused the temple, dedicating it to Saint Martin, and built another chapel on the site of the altar dedicated to Saint John the Baptist. Archaeologist Neil Christie notes that it was common in such hagiographies for the protagonist to encounter areas of strong paganism. Once established at Monte Cassino, Benedict never left. He wrote the Benedictine Rule that became the founding principle for Western monasticism, received a visit from Totila, king of the Ostrogoths (perhaps in 543, the only remotely secure historical date for Benedict), and died there. Monte Cassino became a model for future developments. Unfortunately its prominent site has always made it an object of strategic importance. It was sacked or destroyed a number of times. "The first to demolish it were Lombards on foot in 580; the last were Allied bombers in 1944." In 581, during the abbacy of Bonitus, the Lombards sacked the abbey, and the surviving monks fled to Rome, where they remained for more than a century. During this time the body of St Benedict was transferred to Fleury, the modern Saint-Benoit-sur-Loire near Orleans, France. Monte Cassino was rebuilt and reached the apex of its fame in the 11th century under the abbot Desiderius (abbot 1058–1087), who later became Pope Victor III. The number of monks rose to over two hundred, and the library, the manuscripts produced in the scriptorium and the school of manuscript illuminators became famous throughout the West. The unique Beneventan script flourished there during Desiderius' abbacy. The buildings of the monastery were reconstructed on a scale of great magnificence, artists being brought from Amalfi, Lombardy, and even Constantinople to supervise the various works. The abbey church, rebuilt and decorated with the utmost splendor, was consecrated in 1071 by Pope Alexander II. A detailed account of the abbey at this date exists in the Chronica monasterii Cassinensis by Leo of Ostia and Amatus of Monte Cassino gives us our best source on the early Normans in the south. An earthquake damaged the Abbey in 1349, and although the site was rebuilt it marked the beginning of a long period of decline. In 1321, Pope John XXII made the church of Monte Cassino a cathedral, and the carefully preserved independence of the monastery from episcopal interference was at an end. That unfortunate situation was reversed by Pope Urban V, a Benedictine, in 1367. In 1505 the monastery was joined with that of St. Justina of Padua. During the Battle of Monte Cassino in the Italian Campaign of World War II (January–May 1944) the Abbey made up one section of the 161-kilometre (100-mile) Gustav Line, a German defensive line designed to hold the Allied troops from advancing any further into Italy. The Gustav Line stretched from the Tyrrhenian to the Adriatic coast and the monastery was erroneously thought to be one of the key strongholds, with Monte Cassino itself overlooking Highway 6 and blocking the path to Rome. On 15 February 1944 the abbey was almost completely destroyed in a series of heavy American-led air raids. The Commander-in-Chief Allied Armies in Italy, General Sir Harold Alexander of the British army ordered the bombing. 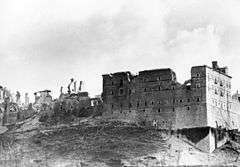 The bombing was conducted because many reports from the British commanders of the Indian troops on the ground suggested that Germans were occupying the monastery, and it was considered a key observational post by all those who were fighting in the field. However, during the bombing no Germans were present in the abbey. Subsequent investigations have since confirmed that the only people killed in the monastery by the bombing were 230 Italian civilians seeking refuge there. Only after the bombing were the ruins of the monastery occupied by German Fallschirmjäger (paratroopers) of the 1st Parachute Division, because the ruins provided excellent defensive cover, aiding them in their defence. The Abbey was rebuilt after the war; Pope Paul VI reconsecrated it in 1964. During reconstruction, its library was housed at the Pontifical Abbey of St Jerome-in-the-City. Until his resignation was accepted by Pope Francis on 12 June 2013, the Territorial Abbot of Monte Cassino was Pietro Vittorelli. 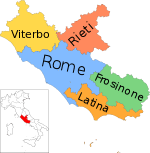 The Vatican daily bulletin of 23 October 2014 announced that with the appointment of his successor Donato Ogliari, the territory of the abbey outside the immediate monastery grounds had been transferred to the Diocese of Sora-Aquino-Pontecorvo, now renamed Diocese of Sora-Cassino-Aquino-Pontecorvo. In December 1943, some 1,400 irreplaceable manuscript codices, chiefly patristic and historical, in addition to a vast number of documents relating to the history of the abbey and the collections of the Keats-Shelley Memorial House in Rome, had been sent to the abbey archives for safekeeping. Fortunately, German officers Lt. Col. Julius Schlegel (a Roman Catholic) and Capt. Maximilian Becker (a Protestant), both from the Panzer-Division Hermann Göring, had them transferred to the Vatican at the beginning of the battle. Another account however, from Kurowski ("The History of the Fallschirmpanzerkorps Hermann Göring: Soldiers of the Reichsmarschall") notes that 120 trucks were loaded with monastic assets and art which had been stored there for safekeeping. Robert Edsel ("Rescuing DaVinci") is more to the point about German looting. The trucks were loaded and left in October 1943, and only "strenuous" protests resulted in their delivery to the Vatican, minus the 15 cases which contained the property of the Capodimonte Museum in Naples. Edsel goes on to note that these cases had been delivered to Göring in December 1943, for "his birthday." ↑ "Catholica Ecclesia". Holy See. ↑ "Vatican announces reorganisation of Montecassino Abbey". Vatican Radio. October 23, 2014. ↑ "Vatican reorganizes Montecassino, mother abbey of the Benedictines". Catholic News Agency. October 24, 2014. 1 2 by Trudy Ring; Robert M. Salkin; Sharon La Boda, eds. (1995). International Dictionary of Historic Places: Volume 3 Southern Europe. Chicago, IL: Fitzroy Dearborn Publishers. p. 132. ↑ Fremantle, Anne (1965). The Age of Faith. Time-Life Books. p. 34. ISBN 978-0652686104. ↑ Durant, Will (1950). The Age of Faith: A History of Medieval Civilization - Christian, Islamic, and Judaic - from Constantine to Dante: A.D. 325-1300. Simon and Schuster. p. 290. ↑ Tomassetti, Aloysius, ed. (1859). Bullarum, diplomatum et privilegiorum sanctorum romanorum pontificum Taurinensis editio (in Latin) (Tomus IV ed.). Turin: Seb. Franco et Henrico Dalmazzo editoribus. pp. 522–523. ↑ "When I Landed the War Was over", by Hughes Rudd, American Heritage, October/November 1981. ↑ Bloch, Herbert (1986). Monte Cassino in the Middle Ages. 1. Cambridge, MA: Harvard University Press. p. xix. ISBN 0674586557. ↑ "Pontifical Acts - 12 June". News.va. 12 June 2013. Retrieved 22 May 2016. ↑ "Pontifical Acts - 23 October". News.va. 23 October 2014. Retrieved 22 May 2016.